Separate charts for needlepoint are not pre-printed or pre-painted upon the canvas itself. Instead, the embroiderer will either trace it onto their own canvas by themselves, or simply keep the chart nearby and check it regularly to find out how to plan and continue to project. Separate charts, also known as chartered canvases, are cheap to obtain, since you can buy a single leaflet or even print one out from patterns available online. Unlike a painted or printed canvas, a separate chart can be used multiple times since you aren’t destroying or altering the chart when using it. Books are available that contain collections of charts for needlepoint. Many of them have a special theme, such as Victorian images, Christian images or winter holiday images. Generally speaking, using a separate chart is less popular in the United States and Canada than in the rest of the world. Most chart designs are either grid form or line drawing form. With the grid form, each thread intersection is represented by a symbol that tells you which colour to stitch on that intersection. The embroiderer will keep the chart nearby and consult it through the project. With the line drawing form, the embroiderer will trace the design onto his or her canvas before commencing the embroidery part of the project. 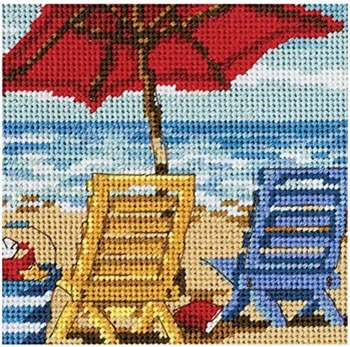 With a hand-painted canvas, the needlepoint pattern is hand-painted on the canvas. Historically, a producer of hand-painted canvas products would typically hire one person to do a set of designs, and then have numerous people doing the hand-painting in accordance to these design, paying them a fixed fee for each finished canvas. If the canvas is stitch-painted, the painter has carefully painted what looks like a stitch where each thread intersection should be, making it very easy for even a novice embroiderer to get it right and picking the right colour for each intersection. If the canvas isn’t stitch-painted, the embroiderer must exercise more judgement about which colours to use for each individual intersection, since the painted on image is a looser guide than what a stitch-painted one would be. Many non-novice embroiderers appreciate this, since it gives them more free range to explore their own creativity when it comes to thread, colour and stitch selection. When you purchase a trammed canvas, the design has already been stitched on by hand with horizontal stitches of varying length, using the recommended colours. Usually, the trammed canvas is sold as a part of a package that also includes all the threads needed to embroider the image. When you use a trammed canvas, you stitch tent stitches over the existing horizontal lines, using the horizontal lines as a guide. If the design includes a large area of mono-colour, this area will typically not contain any horizontal stitches and the package will not contain threads for this area. The embroiderer is thus free to select colour for this section on their own, or even break from the pattern and use more than one colour. Historically, the island of Madeira, located off the north-western coast of continental Africa, was a major producer of trammed canvases for the European market. 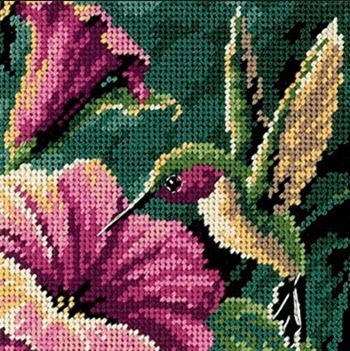 The most common method for producing a printed canvas for needlepoint is screen printing, a printing technique where a mesh is used to transfer ink onto the canvas, and where a blocking stencil is utilized to keep certain areas of the canvas free of ink. Printing the canvas is much quicker and less labour intensive than hand-painting or tramming. On the downside, the colour palette tend to be more limited, which in turn limits the complexity of the design. Instead of buying patterns, or making their own patterns in advance, some needlepoint embroiderers prefer to simply stitch without having any physical pattern to consult. Some have a fairly detailed idea of what they want to the end result to look like, while others go fully free-form and stitch whatever their fantasy suggests to them in the moment.